[SRCTREE-4865] Unable to connect Bitbucket account to SourceTree - Create and track feature requests for Atlassian products. It's not possible to connect a Bitbucket account to SourceTree, as exiting the window will cause the connection to not be saved. Click on Cog icon > Accounts > Connect account. Follow the steps to log in to Bitbucket. 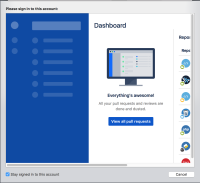 Once you're logged in successfully you'll see the Bitbucket website within this window. There's no way to get out of this window. There's only a Cancel button but clicking it will undo the connection to the Bitbucket account, even if the "Stay signed in to this account" box is checked. Attempting to connect the account from Preferences > Accounts also results in the same outcome.